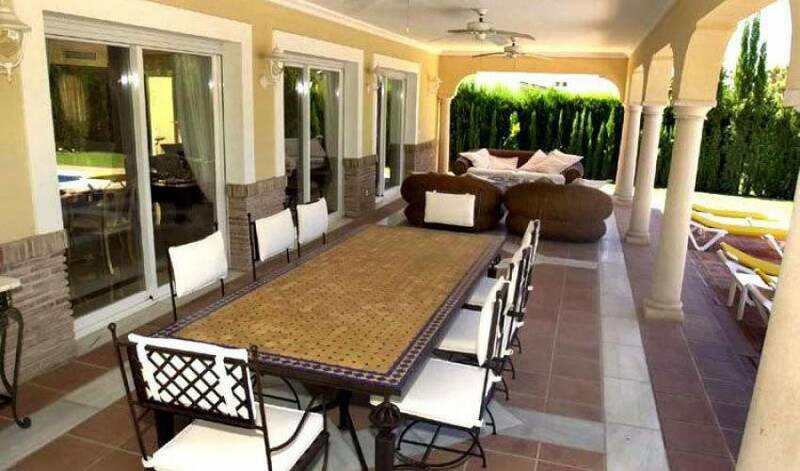 This stunning villa is located in a quiet position, just five minutes from the bustling port of Puerto Banus. 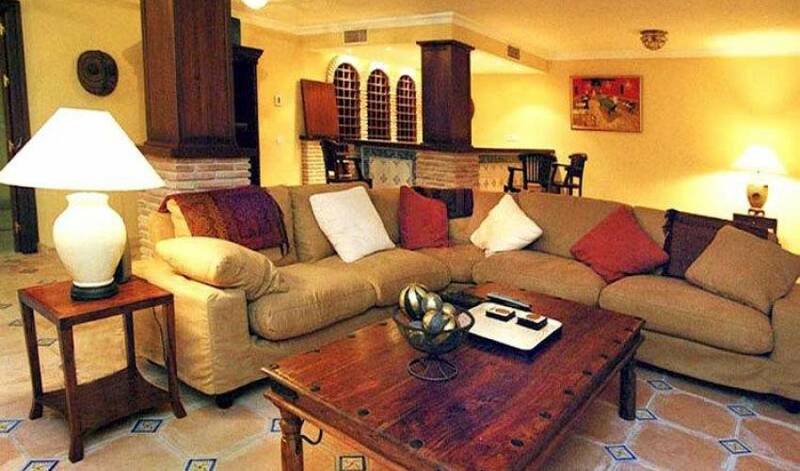 Hidden behind large electronic wooden gates, this villa is the perfect spot for a fantastic holiday. The villa is luxurious, with marble floors and bathrooms, beautiful furnishings and fittings, a huge pool and terrace, outdoor lighting and dining, a cool bodega with a bar, a super kitchen with all mod cons, all set in a tranquil totally convenient location. 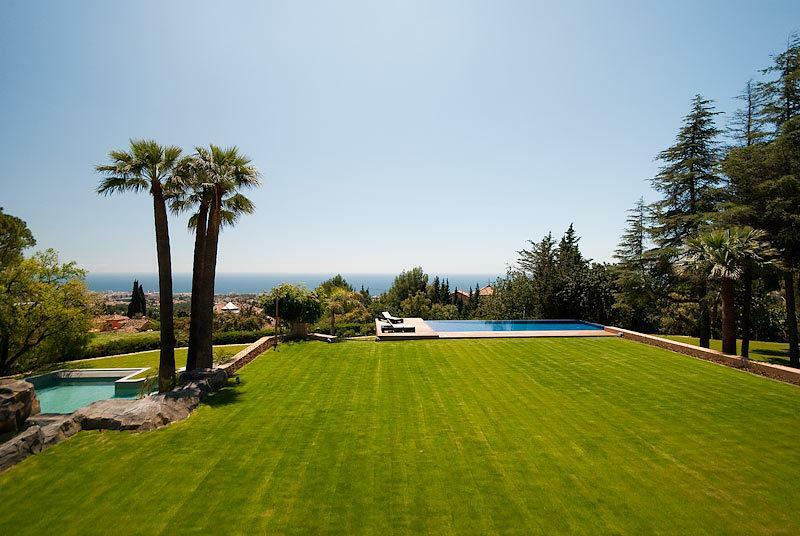 Sleeping up to 12, this magnificent villa is ideally located in the celebrated golf district between Las Brisas and Aloha golf clubs and just 5 minutes drive from Puerto Banús with its fantastic marina, sandy beach, restaurants and nightclubs. The villa boasts ultimate privacy. Large electronic wooden gates open to reveal a paved courtyard planted with shrubs, scented jasmine, bougainvillaea and a double garage. A parking forecourt leads through to a courtyard with breakfast table and on to a beautiful landscaped garden with a 10x5m heated swimming pool and Jacuzzi. Magnificent manicured English lawn with orange and lemon trees and bordered by tall conifers, large terrace with seating and Al Fresco dining table for 10-12 people. 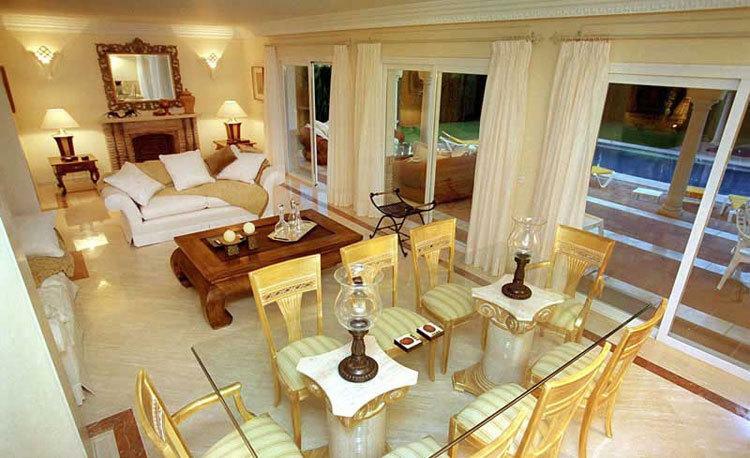 Salon: Three sets of sliding doors lead from the elegant salon to the terrace and gardens. The salon is beautifully furnished with a mix of contemporary and antique furnishings. Enjoy a drink before dinner or luxuriate with a book! The Terrace: Guests spend a lot of time on the terrace. There are comfortable couches and chairs to relax in. 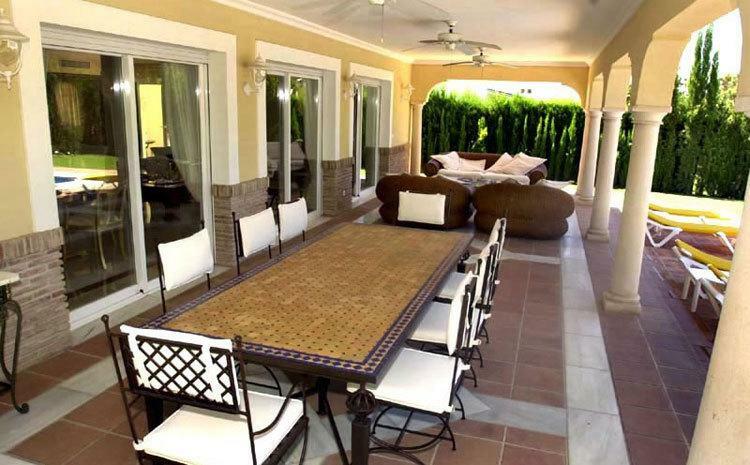 A fantastic “Andalucian” dining table and chairs for al fresco dining, three overhead fans to blow a gentle breeze to cool you, all overlooking the beautiful pool and gardens which are floodlit in the evenings. 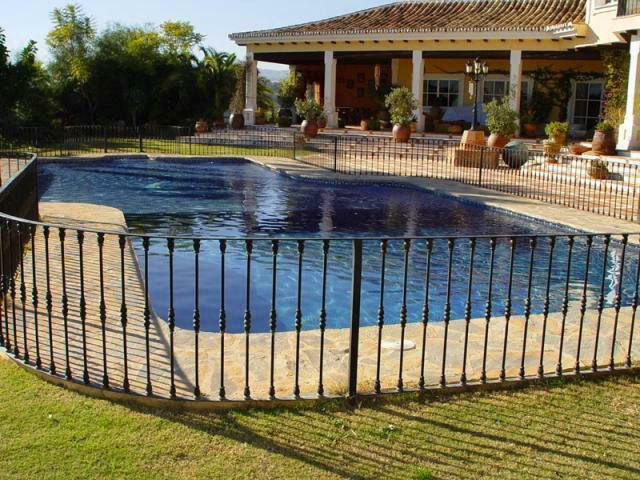 Pool: The pool at this luxurious villa is extra large (10x5m) and can be heated on request. There are plenty of sunloungers and ample space for sunbathing with a shower to cool you down whilst getting your tan! The Courtyard: Sliding doors from the salon lead to a beautiful enclosed courtyard with flowers, plants and shrubs. The ideal haven for a quiet breakfast or an evening drink before dinner. 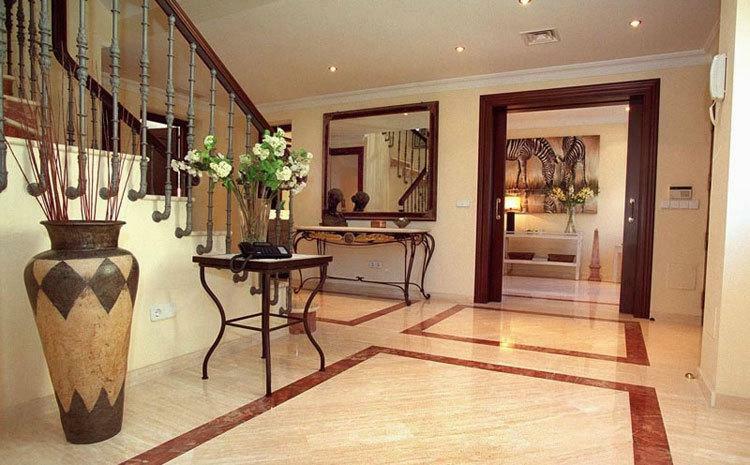 Double entrance doors lead to a marble hall with central staircase, through to a very large elegant drawing room / dining room (Salon) with dining table seating 12. Separate lounge with double sofa bed, guest cloakroom, super modern fully fitted kitchen with an American fridge freezer, electric hob, microwave, dishwasher, granite worktops, central unit, breakfast table and chairs. 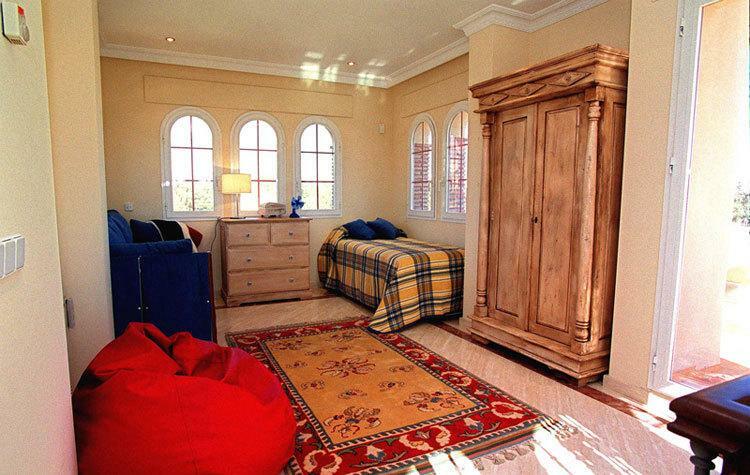 Master Bedroom: Special touches have been added for a romantic feel. 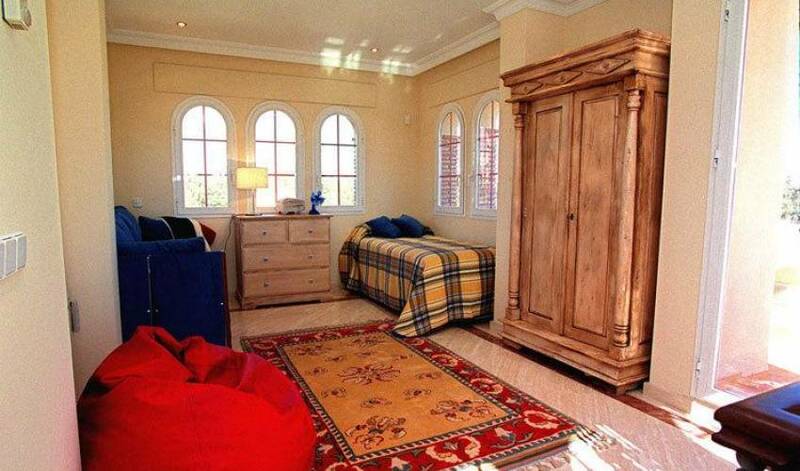 The master bedroom features a four poster king size bed, a dressing room and a walk in wardrobe. It opens onto a large private sun terrace with sun loungers and dining table offering beautiful views of the surrounding areas. 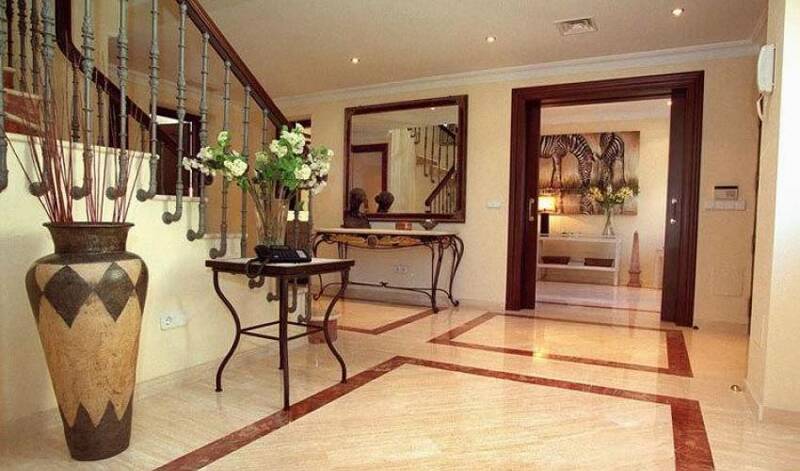 Two further double bedrooms each with en-suite bathrooms. Stairs lead to the tower bedroom. 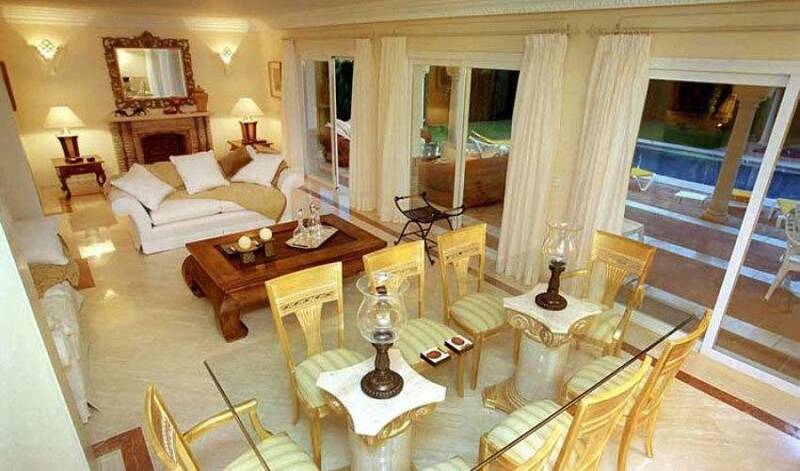 The Tower Room: At the very top of the villa is the ideal teen-agers hang out. The tower has its own huge roof terrace offering superb views of “La Concha” mountain and the surrounding areas. The Bodega: You won’t want to leave the bodega, comfortable squashy suede couches, 32” wide screen TV, Sky Statelite TV, Video and DVD player. A great place to read, play chess, watch a movie or listen to music and if you fancy a drink, take a seat at the bar. 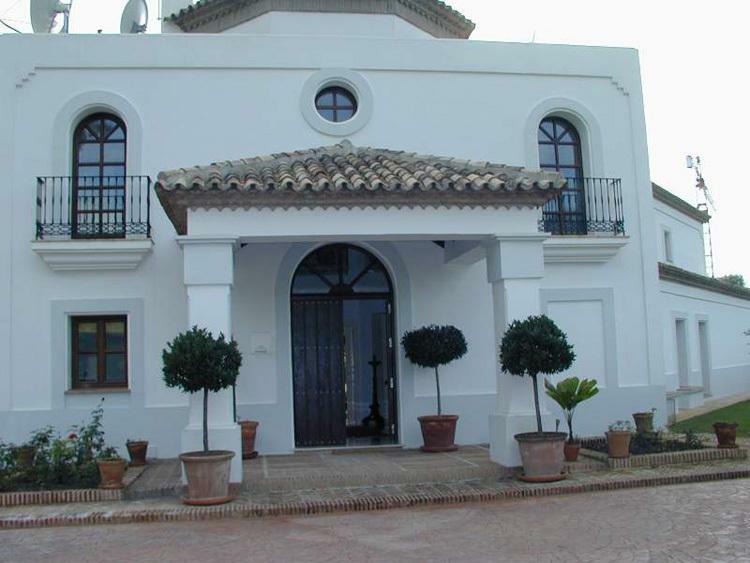 The Bodega can be accessed from either the main hall or from the garden. In addition, this level features a further double bedroom with fully fitted wardrobes and en-suite bathroom and a utility room with washing machine and tumble dryer.